With spirits high they began with a few bottles of wine and some appetizers. Things were going well until it was time to order the entrées. After a long delay, the apologetic waiter returned with disappointing news. The businessman selected another menu item, and the evening continued uneventfully, but talk kept returning to the server’s dilemma. For the group, whose conference focused on employee empowerment, this seemed a fitting illustration of what happens when frontline staff feel they have to continuously ask permission. Contrast that with the second story. The elated couple has told and retold this story to their friends and coworkers, and it stands out to me as an example of what can happen when you empower your employees. It’s understandable that the idea of empowerment worries some owners and managers, especially in the restaurant industry where margins are tight. You can’t rewrite the menu for every customer or start giving everything away for free! So how can you realistically equip your team to confidently address customer concerns and create amazing experiences… without fearing for your profits? Before you can empower our team, you need to have the right people onboard. In his recent blog post, Kris Edwards speaks to attracting and retaining the best staff by hiring for “culture fit” as well as skills. When your roster is stacked top to bottom with talented team members who not only excel at their jobs, but also “get” your restaurant’s brand and what matters most to you, trust comes easier. Change your team if need be, and change your approach to hiring. 2. Set and then teach guidelines. Once you’ve got the right people in place, it’s time to consider your process. “When you are so invested in something like your restaurant, it’s hard to let go,” Edwards says. You care deeply about your guests’ experience and each touchpoint along the way — that’s a good thing! “But,” he cautions, “while that DIY attitude is essential when you’re starting out, it just isn’t scalable as you grow.” So really look at the processes or policies you’ve got in place. Where is it essential for staff to get sign-off from a manager? What types of decisions can a server make on his or her own? While you or your management team can see the broader picture of the business, remember that your staff is often closer to the situation and has a better understanding of the customers’ needs. Striking the right balance is key. We’ve talked about people and process, but here’s a third “p” for you: passion. It’s not enough to just teach your staff the rules. That’s critically important, of course — as Edwards puts it, “training your team is about developing your people in a way that prepares them to make great decisions.” But when they can also feel the motivation and the “why” behind those instructions, when they hear the vision you have for the restaurant and start getting excited about helping create it, that’s where the magic happens. The difference between the two earlier stories is simple. In neither case were the guests upset or unhappy. But in the first instance, the server missed a valuable opportunity; in the second, he seized it. When your employees feel empowered, they’ll not only be ready to deal with any concerns that come up at their tables, they’ll also be able to create those exceptional moments for your customers. The kinds of delightful service surprises that’ll have your guests raving about your restaurant to anyone who’ll listen. 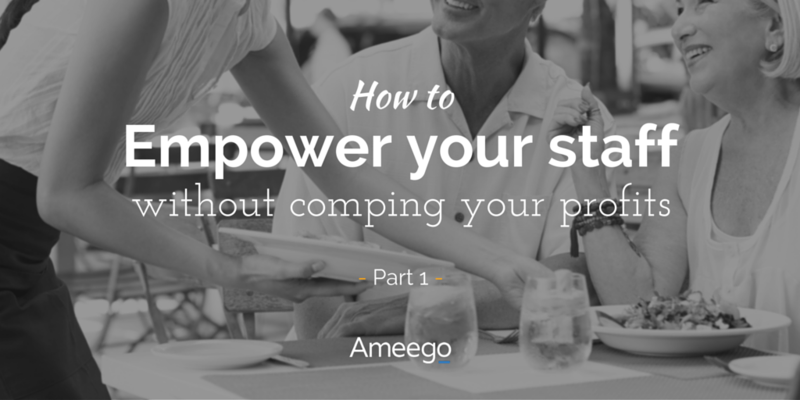 In part two of our series, we’ll look at how empowering your employees helps you as a restaurant owner. In preparation we managed to speak with a few of our clients to gather their thoughts and feedback on the topic. We look forward to sharing their insight with you as well!